"Are human beings basically violent or nonviolent?" This was the question my friend M.P. Mathai and I encountered again and again as we spoke with various audiences in Monterrey, Mexico. We had been invited to come for a three day workshop on Gandhian nonviolence by Mesa de Paz. But since we were there together for ten days, they kept us busy with speaking engagements: 3 TV interviews; 2 radio interviews; a women's organization working against family violence and human trafficking; incarcerated adolescents; four university audiences including a couple hundred psychology students; two high school audiences, one of several hundred young people; and church groups. Almost without fail, in every setting, the question arose. "Are we basically violent or nonviolent?" By the mid point of our visit we had developed a standard three point response. First, I spoke about my own appreciation for the creation story in the Jewish/Christian tradition, where God gives human beings the "breath of life." In nonviolence training, I focus on breath. In fight/flight situations, the breath of life is what enables us to relax the body, clear the mind and envision unexpected responses. We have this energy of divinity in us. The creation story also says we were made in the "image of God." For me, these dimensions of divinity in our origins suggest we are fundamentally nonviolent, whereas our problem with violence comes later, perhaps in the Garden of Eden. Then Mathai would ask the questioner a series of questions. "In what environment are you most at home and happy; one that is violent or nonviolent? In what environment, violent or nonviolent, is the human being most at home and happy? In what environment, violent or nonviolent, is the human person most able to exercise development and creativity?" In every instance, the questioner answered "nonviolent." Finally, one of us would reflect on Gandhi's response to this question. Of course, we all have both violence and nonviolence inside of us. But Gandhi contended that nonviolence was the law of our being. He called our attention to all of those conflicts and disputes that arise daily in families and communities all over the globe that are settled peaceably, without violence. The aberrations, the conflicts that break out into open violence, are the ones that make the news. There is nothing new in the settlement of conflicts nonviolently. It happens all the time. The human challenge is to cultivate the basic nonviolence in our being. It can be nurtured and tended, trained and developed. Violence can be identified, named and crowded out. Self assessment can help with both. 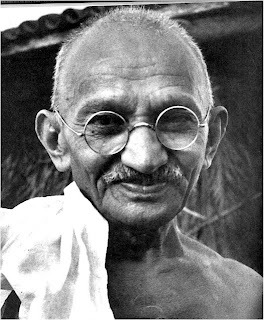 Gandhi suggested a journal to his young grandson for keeping track of his anger. M.L. King suggested we count our times of violence/nonviolence at the end of the day the same way we count our money. We need some way of tracking our spiritual health just like we watch our physical health. In the end, I believe Matthew Fox is right. He claims the original word in the beginning is not "sin," but "blessing." I agree. And God said, "It is good! It is good! It is good!"